Sample some of the top sledding choices in the Boston area. And hold on tight! • Larz Anderson Park in Brookline which offers both huge and more modest hills and parking. • Weld Hill at Arnold Arboretum, corner of Walter and South streets in Roslindale with parking on South street and various side streets. • Prospect Hill Park in Waltham which features some long runs. • Tufts University in Medford. A nice hill in the back of the school. 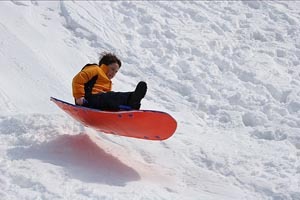 • NARA Park's Amphitheater Hill in Acton is a great location for sledding! It is located at the upper parking lot off Quarry Rd. Open during daylight hours. • Pete's Hill in Sharon, located near Sharon center.